Polk County Sheriff's Office Capt. Betty Holland will take over as director of the Polk State Kenneth C. Thompson Institute of Public Safety on Nov. 24. Effective Nov. 24, the Polk State Kenneth C. Thompson Institute of Public Safety has a new director. Polk County Sheriff’s Office Capt. Betty Holland will oversee the regional training academy. Polk State President Eileen Holden welcomed Holland to campus. “We look forward to Capt. Holland’s leadership,” Holden said. Holland, 46, is a 27-year veteran of the PCSO. She was born in North Carolina, but moved to Winter Haven as a small child. After graduating from Winter Haven High School, she received an Associate in Science degree in criminal justice from Polk State. She then went on to receive a bachelor’s degree in business and professional leadership from Southeastern University and a master’s in public administration from Troy University. She began her career with the PCSO as a booking clerk and dispatcher, before training at Polk State’s public safety institute to become a sworn officer. She was most recently assigned to the PCSO’s Criminal Investigation Division. “This is an opportunity to do something different and to give back. It’s my job now to mold new officers, ensuring that Polk County has a highly trained and highly professional law enforcement workforce,” Holland said. Holland replaces Major Bill Mann, who served as director for four years. 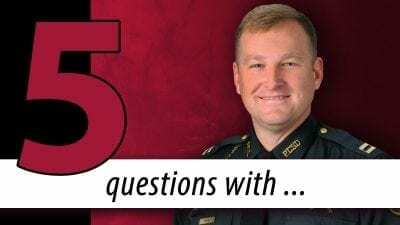 Mann will now head the PCSO’s newly created Safe Schools Division, overseeing security operations at K-12 schools, colleges and universities, including Polk State. The Polk State Kenneth C. Thompson Institute of Public Safety trains new recruits, as well as working law enforcement officers who need advanced or specialized training. It was the first academy of its kind in the nation to receive the Accredited with Excellence distinction from the Commission on Accreditation for Law Enforcement Agencies (CALEA). Holland’s office is located in WCJ 178. She can be reached at 863.297.1038, ext. 5038. 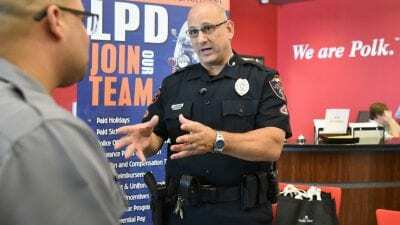 In addition to training provided through the Polk State Kenneth C. Thompson Institute of Public Safety, Polk State Public Safety offers associate’s and bachelor’s degrees in Criminal Justice, as well as training and degrees in Emergency Medical Services and Fire Science Technology.